Failure in Diversity. I’m asking my Native Actors to stay away from this project. “Yellowstone” is telling the world that there are no Native actresses capable of leading a TV show. Unless your great-great-great grandparents are Cherokee. I speak on behalf of all my woman Natives who work so hard to get noticed and they wake up to this. The Instagram post came shortly after Deadline reported Asbille’s casting, but the post has received recent attention after the Asian American community reacted with outcry to the initial casting of actor Ed Skrein (The Transporter: Refueled) — who is not Asian American — to play Major Ben Daimio — who is Japanese American — in the upcoming Hellboy film reboot. Skrein later made headlines for deciding to withdraw from the Hellboy project, citing concerns of whitewashing. Now, the Native blogging community has re-raised Beach’s concerns, and has pointed that it complicates the “whitewashing” narrative when it comes to Hollywood’s erasure of communities of color. In the case of Yellowstone, some within the Native community argue that an actor of color — in this case a mixed race Asian American woman (with some Native ancestry but unconfirmed cultural and political connection to the Native community) — is being used to erase Native identity, much to the dismay of the Native community which finds itself far too often already stereotyped or rendered altogether invisible in mainstream Hollywood film. Many Natives disagree with the federal government determining “who is an Indian” and requiring proof via CIB. 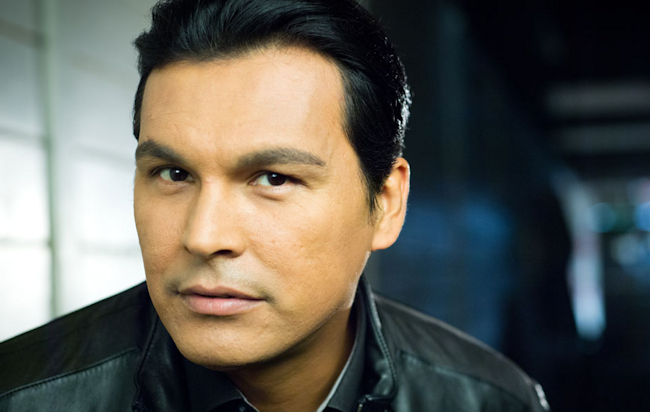 I would agree that an actor who is also connected culturally to their tribe and providing support, motivation and inspiration would be a better choice than someone only claiming ancestry without connection. The issue raises the question of how the casting process in Hollywood, in general, plays into stereotypes of people of colour, rather than serving as part of a search for racial or cultural authenticity in the resulting art. Some actors who are deemed “too ethnic” in appearance find themselves typecast; others who are deemed by look or background to be “ethnically ambiguous” find themselves cast in many different roles, including some that only dubiously reflect their racial or ethnic backgrounds. One must wonder what effect this casting process — which seems to treat non-white identity as a sort of generic “Brown-ness” that can be satisfied with mere “close enough” casting — has on popular constructions of race and racial identity? Why is it that when it comes to white leading actors, the casting process touts itself as rewarding the best actor to play the part? But, when it comes to non-white characters, why does a significant part of the casting process seems to hinge solely upon whether or not the chosen actor fits preconceived (and often inauthentic) notions of what that particular non-white character should look like? And above all, does such a system end up limiting the possibilities for actors of color; and are we not, therefore, fated to end up fighting one another for the scraps at the bottom of White Hollywood’s barrel? Update (9/20/2017): In the wake of the controversy described above, Native American actor, producer and activist Sonny Skyhawk, who also founded the advocacy group American Indians in Film & Television (AIIFT), declared that AIIFT would formally join Beach’s boycott. Skyhawk also reached out to the Eastern Band of Cherokee Indians tribal nation — the nation to which Asbille claimed descent from — to inquire whether their tribal nation records could show evidence of Kelsey Asbille’s tribal membership or lineal descendence. While different tribal nations use different guidelines to establish membership, Skyhawk recently wrote for Indian Country Today that the Cherokee Nation uses evidence of lineal descent — rather than measures of blood quantum — to establish tribal membership. In other words, those who claim membership in the Cherokee nation must demonstrate themselves to be descendants of ancestral (or current) tribal members, and tribal rolls are used to record and identify lineal relationships for this purpose. 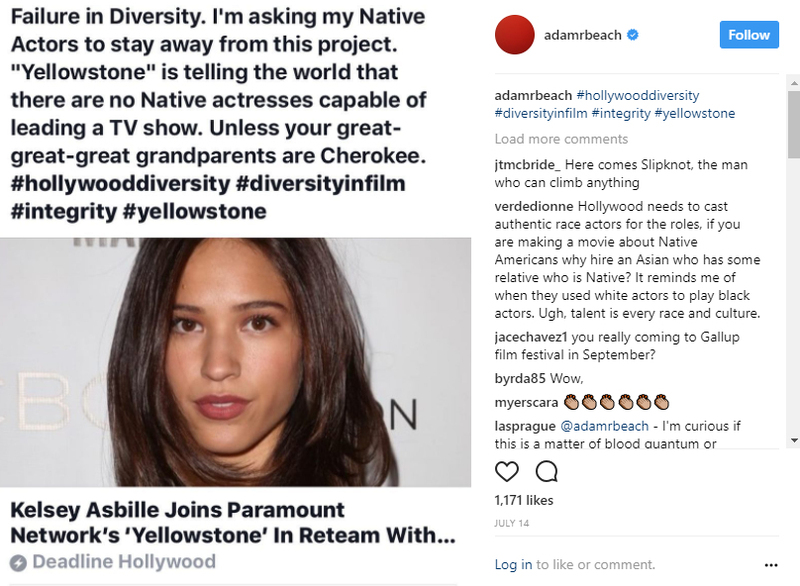 In the wake of this report, the Native community has redoubled its efforts to challenge Asbille’s casting, noting that there are many Native actors available to play Asbille’s role in Yellowstone.